If you like to keep up your pants and like fun things then you should check out this fun SpongeBob and Patrick belt. This is a seatbelt style belt that is adjustable in size and come in two size ranges from 24 – 52 inches and is 1.5 inch wide. On the belt lock you can see the face of SpongeBob Squarepants and on the belt itself you can see SpongeBob and Patrick fishing for jellyfish. 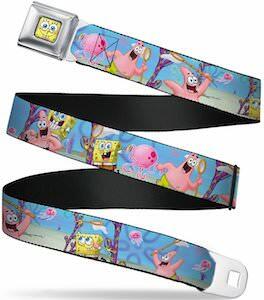 It is just a really fun belt that is not suitable for a suit but will look great on shorts or jeans especially if you like SpongeBob and Patrick Star. If you always wanted to hang out with Spongebob then you should get this women’s Patrick Star dress costume because Patrick is friends with Spongebob Squarepants. The women’s costume includes long gloves and knee socks in the color of the skin off Patrick and then there is the dress that has a ruffle skirt part that is shiny green with purple spots and the body of the dress is the color of Patrick Star with his smiling face on it. It is a sleeveless dress with just some straps that go around you neck. You can get his Patrick Star dress in women’s sizes Xsmall – Large and it would be perfect for cosplay and Halloween. This Halloween you can be a starfish thanks to this Patrick Star costume for adults. Fans of SpongeBob, of course, know who Patrick Star is and you can be him this Halloween. 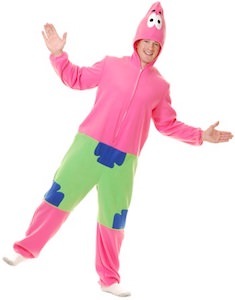 The costume is a nice onesie and is mainly pink with a hood that has the famous big eyes of Patrick on it. And as he always wears green swim shorts the costume also wear them. Both men and women can enjoy wearing this costume so you can even wear it as a couples costume and be two Patricks for the fun of freaking SpongeBob out. Fans of Spongebob know all about his friend Patrick and this time there is a Happy Patrick Star Day t-shirt that shows Patrick’s love of beer. 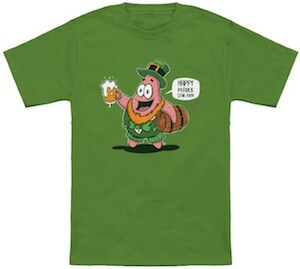 Patrick Star is not the brightest sea creature so he thinks that St Patrick’s Day is a day made for him and this t-shirt shows how much he likes it. On the t-shirt, you can see Patrick Star all dressed up in green and he got a red beard to make him look perfectly Irish and he brought enough beer to share and he is saying “Happy Patrick Star Day”. You can get this funny St Patrick’s Day t-shirt in styles for men, women, and kids and it is available in many colors and sizes. Does you Christmas tree need a new ornament that is fun and cheerful? This SpongeBob Squarepants ornament could be the perfect ornament for you this Christmas. 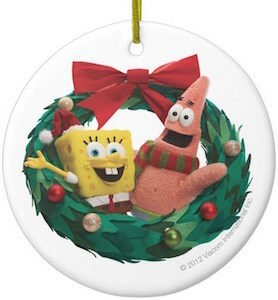 Spongebob and Patrick can be found on this round ceramic ornament and they are surrounded by a green Christmas wreath with a big red bow. And you can find this image of Patrick and Spongebob on both sides of this flat round disc so that everyone can admire the fun creatures from Bikini Bottom. To hang SpongeBob in the tree you just use the included gold colored thread and soon your tree will be fun of joy. School lunches are not great so why not make you child’s lunch at home and store it in a cool lunch box. 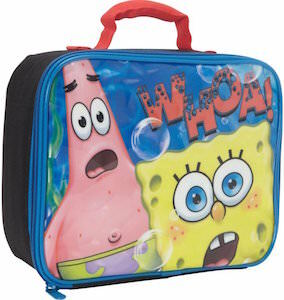 This lunch box is black and insulated and on the front you find SpongeBob Squarepants and his friend Patrick and they are looking in amazement ahead saying “Whoa!”. I am sure if you kid likes SpongeBob then it will love this lunch box. And this lunch box has an easy carry handle on top to make it easy to take to the lunch room. Add some Patrick and SpongeBob to your life with a fun school lunch box. With the Spongebob movie we all found out that the characters of your favorite cartoon can come above water and be cool. So now is the time to make people believe you are one of them. These sunglasses will make you look like Patrick Star. Yes they are pink and will look great on your face and make you head look a lot longer as the top of Patrick’s head will be added to yours. 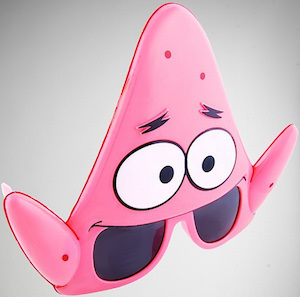 So Patrick’s eyes are just above the lenses and even the sides arms of the glasses look like body parts of Patrick Star. 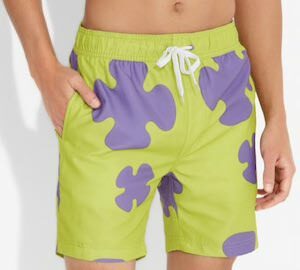 Just wear these and walk around and maybe you run into Spongebob Squarepants himself. Patrick Star may not be the smartest creature in the sea but at least he is friends with Spongebob Squarepants and that should count for something. This black adult t-shirt shows a big picture of Patrick in his famous green swimming trunks. And this starfish really is looking at something impressive as his mouth is wide open and his eyes are at awe to. It makes you wonder if it is seeing something amazing or just scared. But either way it would be pretty cool wearing a t-shirt like this I think. 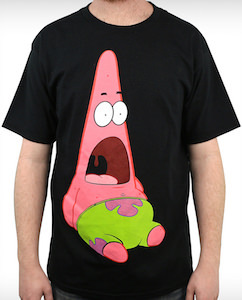 You can get this t-shirt of Patrick in sizes Small – XL and I am sure that Spongebob approves you wearing it. He may not have much common sense and he may be a little dimwitted but even Patrick Star knows to be scared of the Tyrannosaurus Rex. I wonder if SpongeBob SquarePants will come to his rescue, being his best friend and all. This black t-shirt looks like one blurred movie slide with a T-Rex in the background and Patrick Star’s face in the forefront screaming at full tilt. It is 100% cotton and comes in full size range from Small to 3XL. Now wouldn’t your best friend like to have this t-shirt, or maybe yourself. 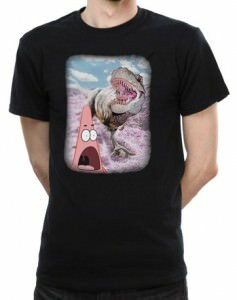 Everyone needs a T-Rex t-shirt, so why not go with the Patrick Star Meets T-Rex T-Shirt.